Who invented the Airplane? The Airplane was invented by Orville and Wilbur Wright who are credited with the first powered, sustained, and controlled flight of an airplane. When was the Airplane invented? On December 17, 1903 Orville Wright piloted the first powered airplane flight that flew 120 feet lasting 12 seconds at Kill Devil Hills, near Kitty Hawk in Dare County, North Carolina. On he same day his brother Wilbur Wright flew their "Flying Machine" covering 852 feet over 59 seconds. The invention of the Airplane during the Second US Industrial Revolution originated in America and is considered a leading achievement, and an exceptional advancement, to the field of Transportation. Fact 1: Who invented the Airplane? The Airplane was invented by Orville and Wilbur Wright in 1903 during the Second US Industrial Revolution era of inventions (1850 - 1914) and was a massive advancement in the area of Transportation. Fact 2: Who invented the Airplane? Although Orville and Wilbur Wright the first powered airplane flight in 1903 another man was dreaming of "Flying Machines" - his name was Leonardo da Vinci. The great Renaissance genius, artist and inventor Leonardo da Vinci (1452-1519) produced plans and made sketches for various types of flying machines way back in 1505 that included designs for an airplane (called the Ornithopter, a human powered flying machine), a helicopter and a light hang glider. Fact 3: Who invented the Airplane? Immediately prior to the invention of the Airplane by the Wright brothers in 1903, there was a huge interest in aviation. In the 1890's the German engineer Otto Lilienthal achieved world wide fame for his gliders and in 1900 the Zeppelin Airship was invented by Count Ferdinand von Zeppelin. Fact 4: Who invented the Airplane? Orville and Wilbur Wright parents were Milton Wright (1828–1917), a bishop in the United Brethren Church, and Susan Catherine Koerner Wright (1831–1889). The brothers were two of the seven children in the family and were raised in Dayton, Ohio. Fact 5: Who invented the Airplane? The intellectual and serious Wilbur Wright was the eldest of the brothers and was born on April 16, 1867 in Millville, Indiana. 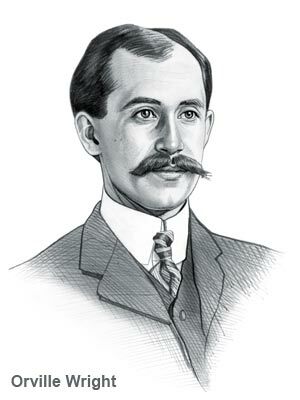 The energetic and extrovert Orville Wright was born on August 19, 1871 in Dayton, Ohio. Fact 6: Who invented the Airplane? The right children enjoyed the outdoor life and loved playing different sports and games. One of their favorite pastimes was playing with kites and before long the boys started making their own kites and their interest in flying was sparked. Fact 7: Who invented the Airplane? The Wright brothers attended high school but neither graduated. Orville started a successful printing business in 1889 and Wilbur joined his brother when he left school. The inseparable Wright brothers were fascinated by all the new inventions that emerged during the Industrial Revolution and were particularly fascinated by the invention of the safety bicycle in 1885 and the Otto Lilienthal gliders. Fact 8: Who invented the Airplane? America was hit by the bicycle craze and the Wright brothers opened a shop repairing bicycles and both of the brothers became excellent mechanics. Fact 9: Who invented the Airplane? Their all-consuming interest in the Otto Lilienthal gliders led to their invention of the Airplane. Orville and Wilbur Wright used the money they had made from their printing and bicycle businesses to build gliders. Fact 10: Who invented the Airplane? It soon became obvious that that gliders lacked sufficient and effective controls and that this could be overcome by using a human pilot to balance an airplane in the air, just as a cyclist balanced his bicycle on the road. Fact 11: Who invented the Airplane? To address the problem of navigation and controls Wilbur Wright invented a simple system called "wing-warping" in 1899 that twisted or "warped" the wings of a glider, causing it to roll to the right or to the left. Fact 12: Who invented the Airplane? In 1900 the Wright brothers built a "wing-warping" glider but it was unable to produce enough lift to support a man in moderate winds. They therefore built an unmanned glider, flying it as if it were a kite. Fact 13: Who invented the Airplane? The invention of a manned Airplane came closer when Orville and Wilbur Wright decided to build a bigger glider that would take a man's weight. They based their design on the "Chanute-Herring Double-Decker" a biplane glider that had been created by another aviation pioneer called Octave Chanute (1832-1910). The Chanute-Herring Double-Decker biplane design was a fixed-wing aircraft with two main wings stacked one above the other. Fact 14: Who invented the Airplane? The invention of the Airplane was extremely swift and by the fall of 1900 the Wright brothers had made a manned biplane glider. Fact 15: Who invented the Airplane? The Wright Brothers decided to test their manned biplane glider at Kill Devil Hills just outside the town of Kitty Hawk in Dare County, North Carolina. The sand dunes at Kill Devil Hills was chosen for the test flight because of the high winds in the area in order to launch the glider and soft sand to land the glider. Fact 16: Who invented the Airplane? Their first manned biplane glider had a 17.5 foot wingspan. Orville and Wilbur Wright continued to experiment with new designs of gliders creating a 22-foot wingspan that traveled 389 feet in 1901 and in 1902 they tested a manned glider with a 32-foot wingspan that traveled 622 feet, lasting 26 seconds. Fact 17: Who invented the Airplane? Orville and Wilbur Wright studied the latest scientific findings in relation to aeronautical design and between October to December 1901 conducted their own research by building a wind tunnel to study the effects of airflow over various shapes. The Wright brothers tested 200 different wing shapes for lift and drag. Fact 18: Who invented the Airplane? As a result of their wind tunnel tests they built a new 32-foot wingspan manned biplane-design glider and achieved their longest flight of 622 feet lasting 26 seconds. Encouraged by their success of their 1902 manned glider, Orville and Wilbur Wright decided to build a powered 'flying machine' requiring engine power, rather than wind power, in order to fly over longer distances. Fact 19: Who invented the Airplane? The Wright brothers asked Charlie Taylor (1868 – 1956), their most experienced mechanic and bicycle machinist to help them make a suitable gasoline engine for the Airplane. Fact 20: Who invented the Airplane? Within just six weeks Charlie Taylor built a four-cylinder aluminum engine for their 'flying machine' based on the brother's designs of the Airplane. The finished engine for their first powered biplane airplane design included a propeller and weighed 200 pounds, producing about 12 horsepower. Fact 21: Who invented the Airplane? On December 17, 1903 Orville and Wilbur Wright made the first ever controlled and sustained flights in their Airplane over the sand dunes at Kill Devil Hills near Kitty Hawk in Dare County, North Carolina. Fact 22: Who invented the Airplane? On December 17, 1903 Orville Wright piloted the very first powered airplane at at 10:35 am covering 120 feet and lasting 12 seconds. Wilbur Wright the had his turn at flying the "Flying Machine" airplane achieving a height of 852 feet lasting 59 seconds. Fact 23: Who invented the Airplane? In 1906 the Wright brothers Patent was granted and the 'flying machine' was called an aeroplane and later known as the Airplane. Fact 24: Who invented the Airplane? In 1909 Orville and Wilbur Wright established the Wright Company and the same year were awarded the Congressional Medal for their contribution to the world of their flying machine - the Airplane. Igor Sikorsky went on to invent the Helicopter in 1939. Fact 25: Who invented the Airplane? Wilbur Wright died of typhoid fever, at the age of 45, on May 30, 1912 in Dayton, Ohio. Orville Wright died thirty years later of a heart attack on January 30, 1948 at the age of 76 in Dayton, Ohio. The name of the Wright brothers will never be forgotten, they will always be remembered as the famous brothers who achieved the first powered, sustained, and controlled flight of an airplane.